I find it extremely difficult to make good pictures with a microscope. Mine does about 400x and it has a polaroid filter which helps to avoid glare on steel surfaces. Lightning is very important. But at 400x you are starting to get close to the wavelength of light, so it is not unusual to see weird things happening around the edge. Here is an example, O1 tool steel after 150 meters planing in beech. The wear on the bevel side of the iron is very visible. There is some redish light scattering over the edge. 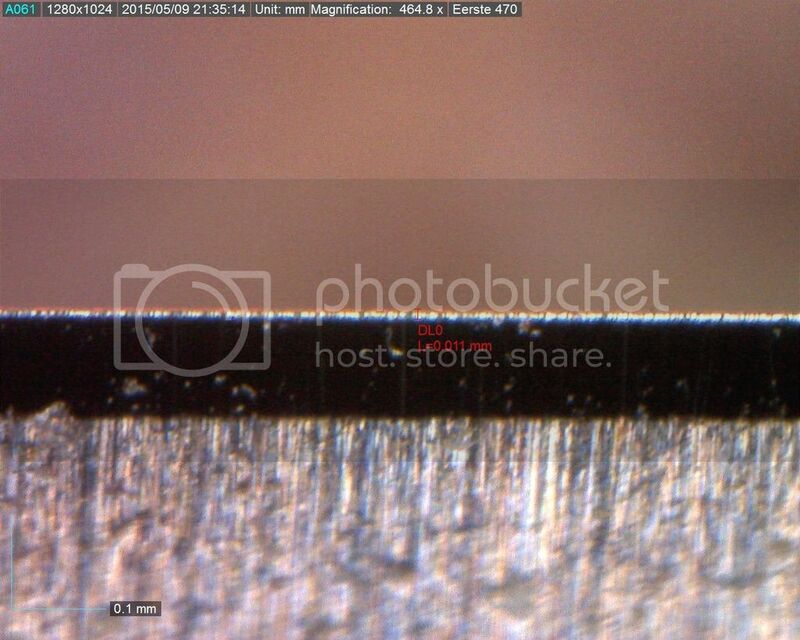 The black area is sharpened on a 8000 Naniwa SS, below that are the 1000 grit scratches from a Sigma stone. I tilted the iron so that the 8000 grit area was very dark, because I wasn't interested in that. I was interested in the wear area. You can see how some stray scratches are still visible, and they don't seem to be starting points for edge damage. I think the lighter spots on the black area is just dirt in this case.